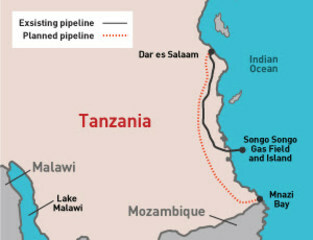 The construction of a Chinese funded gas pipeline from Mtwara to Dar es Salaam, possibly turning Tanzania the third largest gas exporter in the world, causes protests and violent repression by state forces. Tanzania signed a contract with three Chinese companies on 21 July 2012 to start construction of a 512-km pipeline leading from Mtwara to the country's capital Dar es Salaam. The project is financed by a Chinese loan as well as grants from the World Bank (USD 300 million) and the African Development Bank (USD 200 million). Initially, there were plans to build a gas processing plant in the city of Mtwara. The catalyst for the protests that emerged was the announcement of the government's decision to construct a gas pipeline leading from Mtwara to Dar es Salaam instead of a gas processing plant situated directly in Mtwara. Earlier during the planning phase of the project, promises were made that such a processing site would boost local development. On 27 December 2012, thousands of residents from Mtwara undertook a 10 km march protesting the pipeline construction plans. Other demonstrations soon followed. A legislative member and lawyer, stated to the press: "I don’t believe the country is ready to implement the existing systems and laws that will effectively protect our coastal environments. Tanzania stands already vulnerable and ready to lose its once glorious and bountiful coastline, which is a major tourist attraction both above and under water". During the January 2013 protests, around 44 people were arrested in connection with the violence and riots that occurred. When the protesters clashed with police at the end of January, 4 people were killed and 12 more were injured. Houses of senior politicians were said to have been burnt during the protest. On 27 January 2013, protesters reportedly destroyed more than 10 vehicles of the Masasi District Council, set fire to a court building as well as the district education office and several local officials' personal homes. On 22 May 2013, street battles and protests erupted again in Mtwara, when residents were not satisfied with the government's handling of mineral resource wealth and the contracts signed for the pipeline project. Police and army forces used teargas and live rounds to shut down the unrest in the towns of Mtwara and Mikindani. The country's opposition parties have been calling for greater transparency over the natural resource extraction contracts the government has concluded with foreign companies. They demanded to make public all of the contracts signed with foreign government, especially with regards to the construction of the Mtwara – Dar Es Salaam pipeline funded by discounted loans from Chinese government investors. During the May 2013 protests, 90 people were arrested and one person was killed. The Home Affairs Minister also stated that several houses and other property had been damaged as well. Police forces broke up the riots with teargas before making sweeping arrests. Army forces had also been deployed to settle the unrest and when one of the vehicles transporting them to the site got in an accident, four soldiers were killed. In reaction to the protests, President Jakaya Kikwete issued a strong statement on 22 May 2013, saying that it was unacceptable to call for a stop of the construction of the pipeline. He also affirmed his belief that it “is something unacceptable that national resources can be restricted only to the place where they are found”. He made instructions to security forces to search and arrest everyone involved in the violence. The president also reaffirmed the government's earlier promises to build 57 factories in the region in order to tackle unemployment in exchange for the gas processing plant which was not built in Mtwara. The construction of the pipeline was completed by begining of 2015 and in test started in July 2015. In these circumstances, Reuters has announced that "discoveries off east Africa's seaboard have led to predictions the region could become the world's third-largest exporter of natural gas". Project Details According to information provided by the Tanzania Petroleum Development Corporation (TPDC), the pipeline will have a capacity to transport around 22,2 million cubic meters of gas per day, generating 3,920 MW of electricity. The pipeline will include a 512 km pipeline on land in addition to a 30 km concrete-coated pipe running through the Indian Ocean from Songo Songo Island to Somanga area. Development of Alternatives Local residents urged the Tanzanian government to build a gas processing facility within the Mtwara region instead of the pipeline to the capital, as initially planned. They were convinced that this would have boosted the local economy. Why? Explain briefly. During the protests, at least 5 people were killed and at least another 12 were injured. Over 134 people have been arrested in relation to the protests and marches. Despite the opposition to the project, the Tanzanian government went ahead with the construction of the pipeline. By July 2015, tests were conducted on the finished pipeline.